Please Be advised that Alternative Brands May Be Supplied. 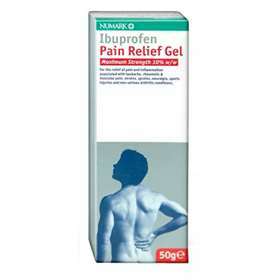 Squeeze 2 to 5cm of the gel (50 - 125mg of ibuprofen) from the tube and rub into the affected area until absorbed. Apply as necessary, up to a maxiumum of 4 times a day, but not more frequently than every 4 hours. Apply with gentle massage only. Do not exceed the stated dose. If symptoms persist, consult your doctor or pharmacist. Wash your hands after each application. Discontinue use if rash develops. This gel contains Ibuprofen 10% w/w.